Roadwater Players Perform Robin Squire's Farce "Hot Property"
Early in February the first read-through by the excellent Roadwater Players took place at their village hall in Somerset, and I was privileged to be there. These lovely people were generous enough to let me mingle amongst them, potter about the hall and mount the small but adaptable stage where my new farcical comedy HOT PROPERTY will be performed from 9-13 May this year. They even let me participate by reading the part of ‘Clive Penfold’, who comes on towards the end and at the time hadn’t been cast (it has now). It was the moment to air my dodgy cockney accent combined with ‘ultra-posh’, and to realise how much more gifted all these actors are than the humble writer when it comes to actually playing a part. 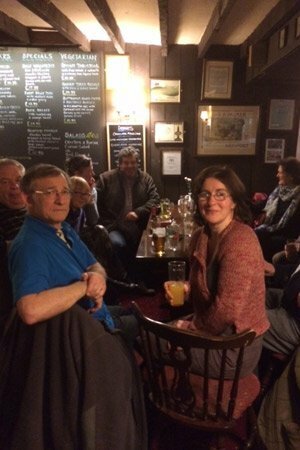 We congregated afterwards in The Valiant Soldier pub to relax. Director Peter Jaques and I have since had almost daily conversations, and I’m finding the whole process of developing a play for performance fascinating, even daunting. As this is the first time HOT PROPERTY will have been performed anywhere, it’s to be billed as a World Premiere. Not my idea, theirs, and totally brilliant. The Roadwater Players have since held weekly rehearsals, after which Peter has been exchanging notes with me by phone, and it really is a learning curve because all sorts of little problems and bits of practical business and stage movements come to light in the process, which we do our best to resolve during our chats, though it’s the Director and the Players who are at the sharp end of these adjustments. The actors are due to come ‘off the book’ for the rehearsal of 23rd March; by then they will have memorised the lines and be able to concentrate more on movements and character interaction and bits of physical ‘funny business’. I’m very much looking forward to driving down there again some time in early April and meeting them all again. Closer to opening night, tickets will be available in the Online Shop of the Players’ website (link below).